The impressive new set is the first passive 3D TV to achieve THX certification. It wasn't long ago that LG first announced what one representative called "the crown jewel of televisions." Now the 55LW9800 is available at a price of $3,799. LG's new set is remarkably thin and features a bezel to match. As nice as the TV looks, it's the pictures on it that really matter, and THX certification, Nano LED technology and TruMotion 480Hz surely help to reassure that you're going to be getting some great images on the 9800. The 9800 is packed with passive 3D technology which LG says is nearly cross talk free and thanks to 3D Light Boost you won't be losing color or brightness in your picture. The set using passive technology which means you won't have to deal with expensive glasses that use batteries or need to be recharged. 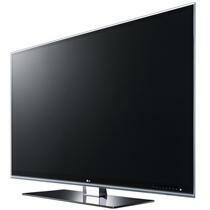 LG also added an expanded Smart TV suite into the 55 inch set. It has the usual set of apps all organized in a store that can be browsed with the Wii like Magic Motion remote.